In general, I am a visual learner--It's a case of monkey see, monkey do. 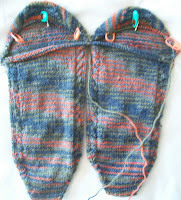 Knitting socks (well knitting HEELS of socks) was one of those things that I had see, and hear and do before I got it. (It took a long time for me to learn how to do heels) But then, once I got one got it –I GOT IT. For a long time I slugged away, not really being able to read a patttern and understand what kind of heel was going to be created. And then Suddenly—I Knew! I knew the heel I was knitting, I knew other heels, I knew how 1 or 2 stitches difference here, was going to create a HUGE differences there. I got how other heels worked –and while I recommend Heels by Number all the time, for me, (now) it's totally unneeded. I can see. It was a eurika moment. So my heel.. a reversed F/T/G heel (where F/T/G is Flapped/Turned/ Gussetted). At the same time (Those oh so dreaded words!) 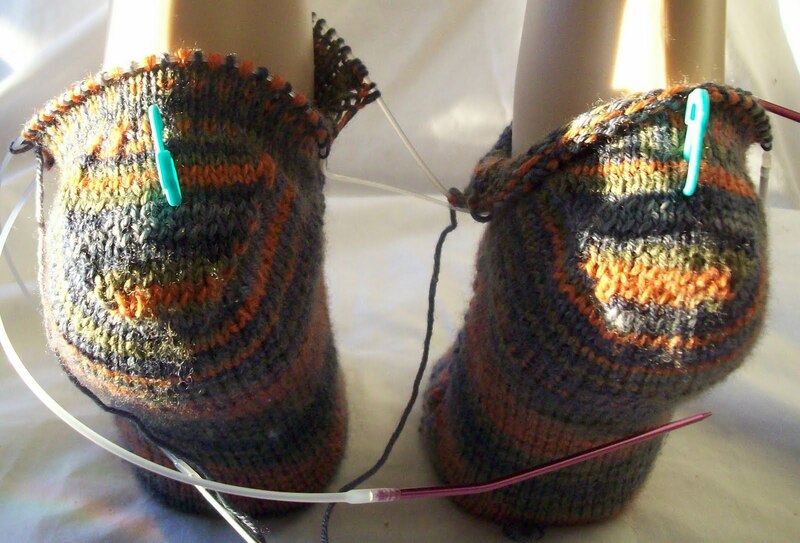 I will be continuing the small cable pattern on the front of the sock—as I am once again knitting in the round. 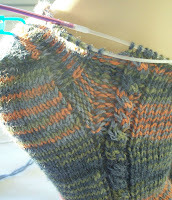 the center part (34stitches) will be worked in REAL eye of partridge stitch (not half eye of partridge stitch. But working in the round, eye of partridge is quite easy! Heel stitch is useful for making the heel (back of heel, where the shoe rubs against the sock) stronger, and it also changes the gauge (making the heel fit better!) and pulls the sock tight on the back of the heel. 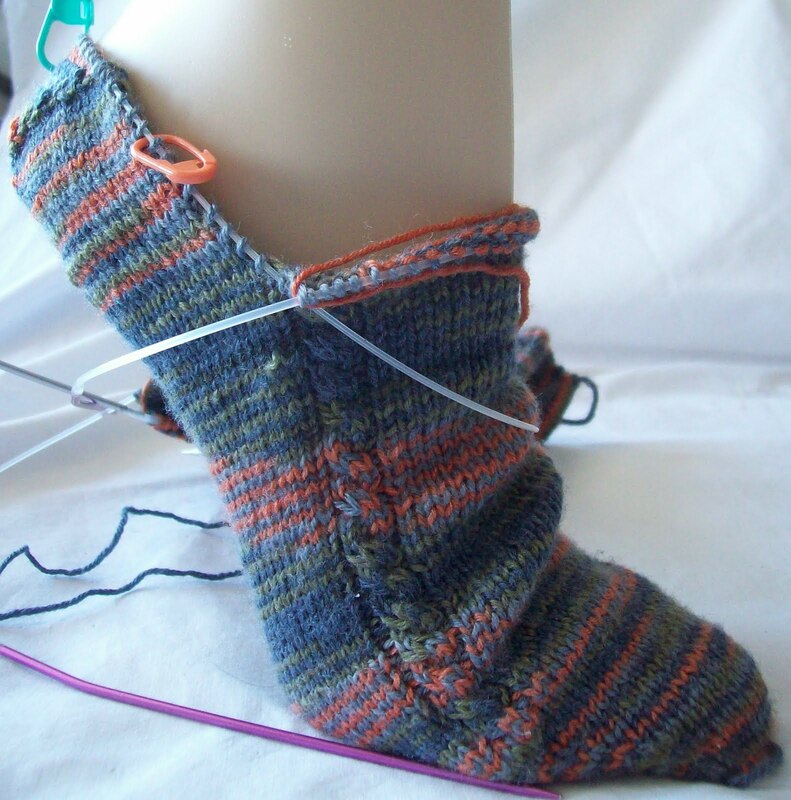 Another change with the reverse engineered F/T/G heel, is the turning that in a top down heel tend to be on the bottom (sole) of the sock, is with a reverse engineered heel, at the back of the heel. (More so on the Leg's(image) than in real life..I wear a size 9/EE shoe—the legs have smaller feet (size 6/C) so my socks are always sligthly big on them as I model them. See them now, mid afternoon--not to clearly(too much sun!) and again tomorrow in better light.